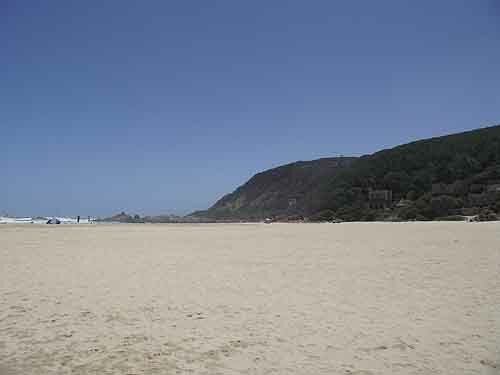 Knysna is a top class holiday destination on the Garden Route of South Africa. It is a beautiful town built on the banks of the Knysna lagoon. "Nice Ne' " meaning Nice hey is the affectionate name of the town. 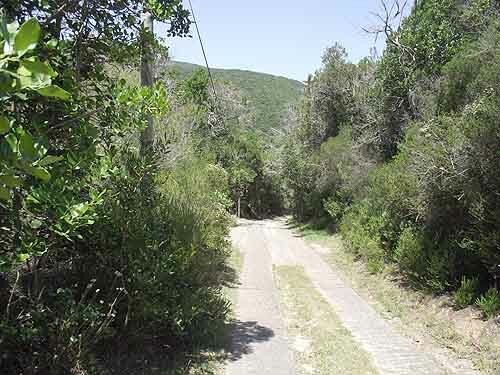 Knysna is surrounded by forests and water and in days gone by was the timber capital of South Africa with the timber being exported from the area by trains and ships through the mouth of the lagoon called the Knysna Heads. 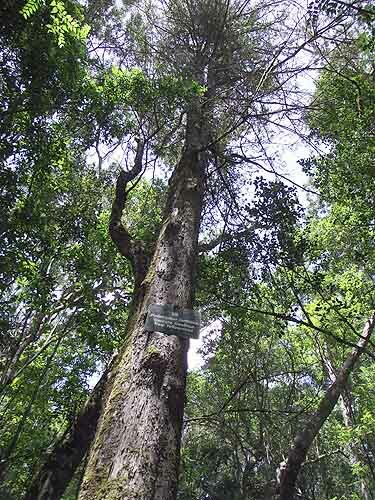 Unfortunately most of the forests which were found along the Southern Cape coastline have been cut down for timber and only small pockets are left.The most well known are the Tsitsikamma Forests around Knysna. 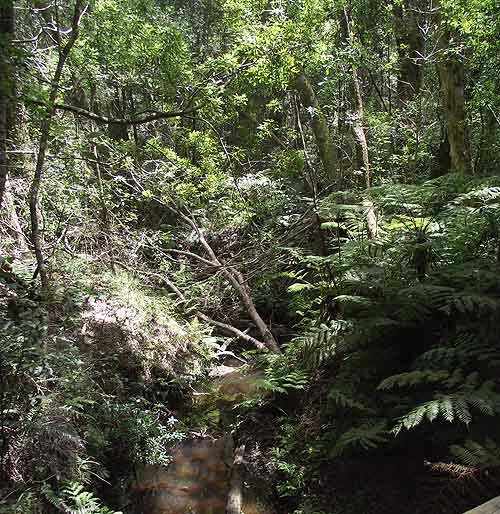 Travelling towards Knysna from Plettenberg Bay we come across a section of forest which is open to to the public. It is known as the Garden of Eden and is laid out with wooden pathways through the tall indigenous trees which grow there. This section of the forest is untouched other than for the pathways that have been laid out for the public to use. A small entrance fee is charged. Funds obtained are used to pay for the access control and to keep the forest pristine. The pathways through the forest allow young and old as well as people in wheel chairs to easily use the forest and enjoy its beauty. Leaving the Garden of Eden we travel further westwards and turn ff the N2 highway and make our way down to Noetzie. 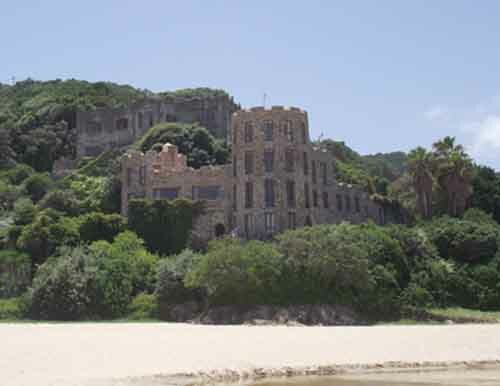 It is a very small village on the coast and is well known for its castles built on the mountain side above a secluded beach. To get to the beach is quite difficult as there is a staircase of about 200 stairs which are almost vertical to climb down. 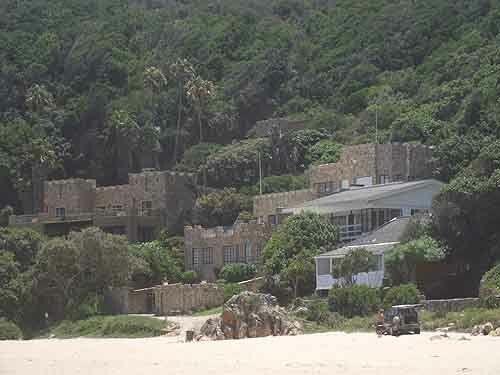 There is however a road on the eastern side of the beach used by the castle owners to get to their castles. This road is also very steep and one has to be pretty fit to get up and down from the beach. The road is not open to public vehicles so one has to park at the top of the hill and walk down to the beach. The beach has beautiful clean golden sands and a lagoon and river on the eastern side. Angling off the beach and the nearby rocks is also permissable. Forests and bush surrround the lagoon and the castles. 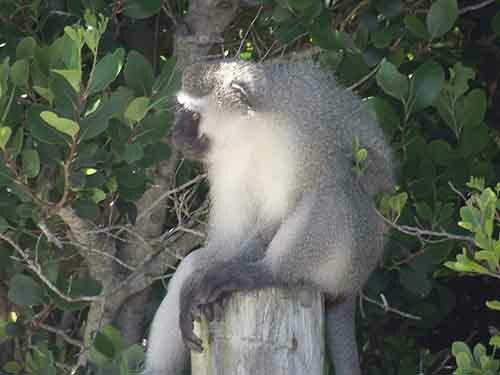 Monkeys roam free in the trees and loiter around the parking area scrounging for food in the bins. I am sure that they would get into your car if you left it open and left food lying about. The monkeys are not altogether wild but move off when approached by humans. Along the gravel road to Noetzie the road runs through quite a unique forest. 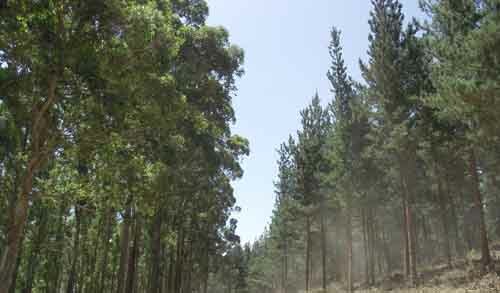 On one side of the road are pine tess and on the other blue gums or eucalyptus trees as they are known as in Australia. The only thing different between Knysna and Australia eucalyptus forests is that there are no Kaola bears. From Noetzie we head back to the N2 highway and down into the town of Knysna. 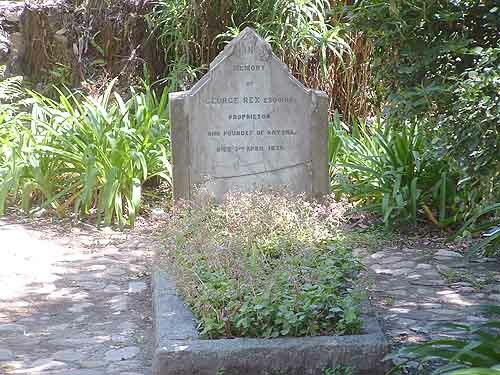 On the way we pass the grave of George Rex the founder of Knysna who was quite a controversial figure in his time. He arrived in Cape Town in 1797, sent here by the British Royal family to avoid a scandal. George Rex is believed to be the illegitimate son of George III, Prince of Wales. Legend has it is that he was the forgotten son of George the III and should have become king instead of George IV on the death of his father in 1820. Had he inherited the throne there would have been a completely different royal family in Buckingham Palace today. In 1803 when the Cape was returned to the Dutch George Rex moved his entire family and large entourage to the farm Melkhoutkraal, which he had purchased in Knysna. 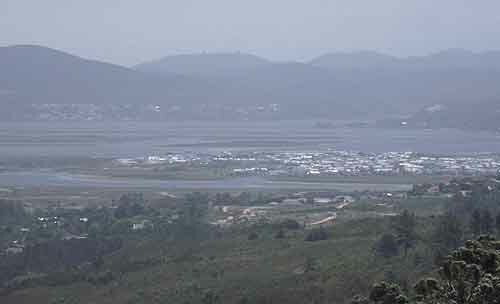 The farm included the whole lagoon and the area today known as Knysna. The land was covered in indigenous forests and a natural industry for the area was timber. As it was very difficult to move timber by ox-wagon George Rex proposed building a harbour in the lagoon and in 1817 the 188-ton Royal Navy brig Emu made the first attempt to enter the lagoon through the Knysna Heads. Unfortunately for her she struck a submerged rock in the channel and was badly damaged and had to be beached to stop her sinking. 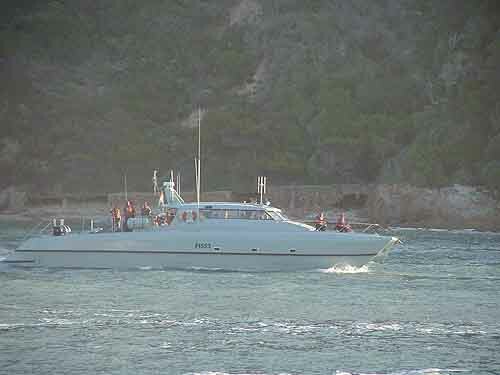 In 1817 Knysna became a port for naval and commercial ships. Ships entering the lagoon brought in goods and shipped out timber. In 1820 George Rex ceded some of his land to the British Admiralty to allow them to build a port in the lagoon. Unfortunately this project was never completed as fires destroyed the buildings and a ship that was being built there. The land that was supposed to be used for the dockyard was later laid out as a village which was named Mellville. 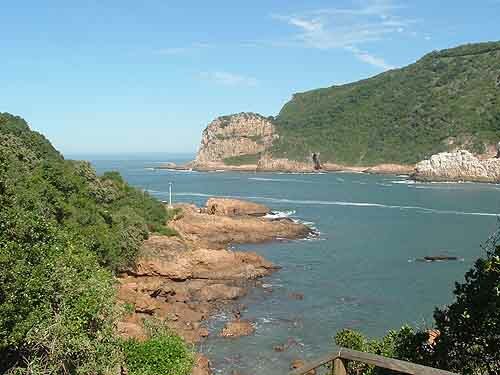 The Knysna Waterfront is very popular with its small boat harbour and is also the starting point of a popular cruise across the lagoon to the Featherbed Nature Reserve where a short tour and walk can be undertaken. Lunch is served after the tour before transfer back to the waterfront. In July the Knysna oyster festival is normally held and attracts thousands of people to the town. Since the early days of Knysna, oysters have been readily available in the area but due to demand collecting them in the wild is no longer commercially viable. The cultivation of oysters was first muted in 1946 by a retired wine merchant in the Knysna area but first attempts were not very successful. In the early 1970's it was decided to import 3 - 4mm oyster seeds from either Chile or France. These were placed into a specially designed nursery in Port Elizabeth where the oysters lie in bins with mesh screens for bottoms and fresh salt water is pumped through them. The oyster seeds grow quickly and after about three months grow to between 10 and 12 mm in length. When they reach this size they are removed from the oyster bins and transferred to the Knysna lagoon where the next phase of their development begins. Suffice to say that the Knysna oysters are more wildly travelled than most visitors to Knysna. Knysna was also well known for its herd of wild elephants but unfortunately these have died out. You can however see the skeleton of one of the elephants at the tourism office in the main road of Knysna. 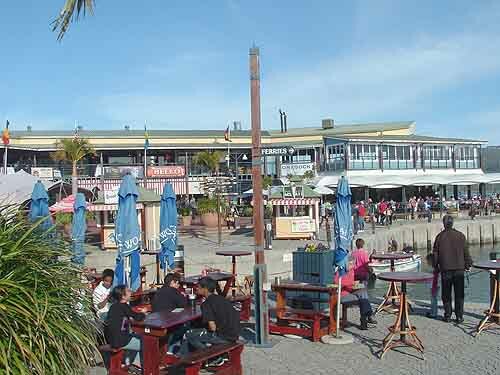 Today Knysna is a mixture of old and new and is a much sought after holiday destination. Its a great holiday destination. Visit us this coming summer.